The Out There Exposition happens Saturday, April 13, at 33Arts and Studio Santa Rosa, 3840 Finley Ave, Santa Rosa. 1pm to 7pm. Free. 33arts.org. 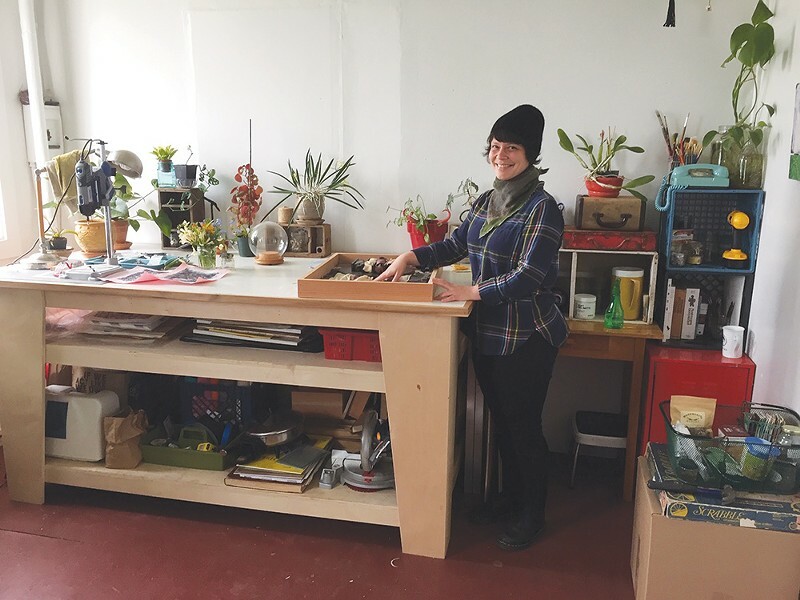 Beautifying the Barracks Assemblage artist and 33Arts resident since 2015, Jessica Rasmussen shows off her studio, located in former soldiers' quarters. In west Santa Rosa, just south of the Joe Rodota Trail on the way out to Sebastopol, lays a largely forgotten piece of local history. "It's surprising how many native Santa Rosans don't know about it," says Julian Billotte. He's talking about the former Santa Rosa Naval Air Station, built during WWII, that today consists of a pair of two-story barracks, a former ammunition bunker that once housed an infamous punk venue and has the remnants of an airstrip. From the outside, the two barracks look much like they did 60 years ago, but inside, art thrives. Building 32 has housed local artists as the Studio Santa Rosa since the 1980s, yet Building 33 went vacant for many years before Billotte and his wife, artist Anna Wiziarde, discovered, renovated and reopened the building five years ago under the name 33Arts. This isn't Billotte and Wiziarde's first time running an art space. In fact, it's not even the first time they've run a former military barrack-turned art building, as they've managed Arts Building 116 at Hunters Point Shipyard in San Francisco since 1997. "The first time I brought my daughter up here, she said, 'how did you find a shipyard in Santa Rosa?'" laughs Billotte. "It's not on water, but this looks pretty much the same; same color paint, same smell, same ladder that goes up and down the building." Moving to Sonoma County six years ago, Billotte says he was looking for a studio when a friend sent him the floor plan of Building 33. "It was totally dilapidated," he says. After a year of cleanup, 33Arts was born in 2014, and it is now the home of some 30-plus artists who work in every kind of medium. While 33Arts typically does only one big show a year, it and Studio Santa Rosa will host one of the season's biggest art outings when the Santa Rosa Out There Exposition takes over the grounds on Saturday, April 13, for a variety of arts and performance offerings. Among the highlights of the expo will be The Lost Church hosting a lineup of local musical acts, the North Bay Cabaret's variety of performers, loads of local food trucks and many exhibiting artists. "We're happy to be working with the heart of the Santa Rosa art scene," says Billotte. One of the expo's art shows will happen in 33Arts Map Room Gallery, named for the floor-to-ceiling map of 1940s Los Angeles hung on the wall by the military, once hidden under layers of paint. Several 33Arts studios will be open, and Billotte will display works from his gilding and frame restoration studio, Capricho Framing. "It's such a great community that's sprouted up around us renting these spaces," says Wiziarde. "We've encountered so many great artists and great people, and people are happy that they can have an affordable art studio."